Spin This: "Best Friend," "Coming of Age," "Fire Escape"
Indie pop/rock band Foster the People stormed out the gate with their breakout hit “Pumped Up Kicks” in 2010, releasing their debut LP Torches the following year. The rise to fame was immediate, although the quest to find the perfect follow-up single seemed to peg them to one-hit wonder status. Catchy Passion Pit-meets-Daft Punk hits like “Helena Beat” and “Don’t Stop (Color on the Walls)” stormed up the alt-rock charts, but the pop side unfairly turned the other cheek. That still hasn’t stopped the L.A. band from evolving, something they stretch towards on their sophomore album, Supermodel. If you’re searching for something remotely similar to “Pumped Up Kicks,” chances are you’re not going to find it. “Coming of Age” seems to walk in its sing-a-long footsteps, but it’s a smart detour into grandiose ‘80’s New Wave rock. What they do confront on this journey is step-up evolutions into psychedelic pop (“Nevermind”) and trance rock (“Pseudologia Fantastica”). The choir-like backing vocals are also beefed up, giving Paul Epworth’s production a kind of ethereal anointing inside the lyrical dangers of this gloomy psychedelic universe. For those that missed it the first time inside the dark meanings of their fly-by pop smash of 2010, moods of sadness and danger run about once again. You can hear it in the chorus of “Fire Escape” as the Paul Simon-sounding lead singer Mark Foster and a chorus of downtrodden angels sing, “Save yourself, save yourself, yourself.” With its minimalist production and unapologetically acoustic boundaries, the folky finale is just as intoxicating as the musical art packaged inside the tracks that precedes it. Uptempo workouts into druggy disco are also ever present with “Best Friend” being the most impressive. As if the Nile Rodgers funk of “Get Lucky” – or better yet, David Bowie’s “Let’s Dance” – crept into their garage rehearsals, the Isom Innis-Mark Foster composition quickly turns the atmosphere of CBGB into a rollicking den of Studio 54 revelers: “When your best friends are strung out/You’ll do everything you can cause you’re never gonna let it get ‘em down.” The album opener “Are You What You Want to Be” also shows off groovy rhythmic pulses as its disco rock pizazz floats with a constellation of Vampire Weekend world music executions. 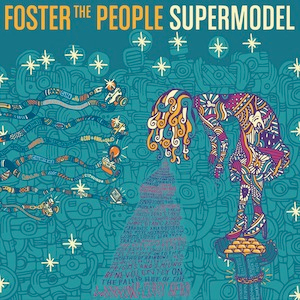 So what if Supermodel might be quickly judged for being “Pumped Up Kicks”-less. It’s still a slightly better record than Torches and showcases a band willing to experiment and play up to their strengths. It might be a bit ballsier, a bit more rock-centric, a little less pop and a little slow-paced at times, but that’s all right. As a cohesive album from beginning to end, it plays very well.